There’s a common thought among those of us who love the beach that we’re always looking for the perfect escape. That elusive perfect combination of beach, tropical and laid back environment is what I dream about – and sometimes I wonder if I’ve already seen it – or if there’s another option to be found. 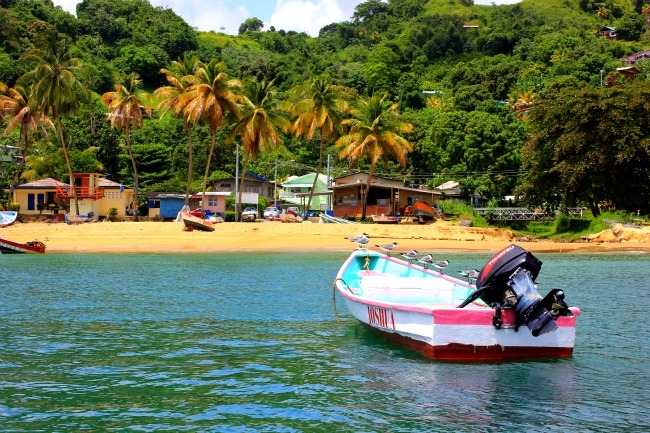 Taking a boat ride along the Caribbean coast of Tobago, our guide stopped us here to talk about the island, and I spotted this strip on shore. A colourful row of houses and boats – it seemed like an ideal place to leave the big city and put up my shingle. Forget the practical side of necessities for everyday life – doesn’t this look like a place that would make you happy? make you feel safe? and inspire? As my boat continued up the coast, I wished we had gone ashore, just to indulge my curiosity about whether this stretch was all as I imagined. But then I realized like a lot of travel, there’s a dash of imagination that takes over from the reality. My impression solidified that it was in the running for my ideal beach home. So no matter if I return or not, I’ll always remember this with fondness and know that this heavenly spot is waiting for me.